Now Published by Springer Two major factors brought about the establishment of the Netherlands Yearbook of International Law in 1970: demand for the publication of national practice in international law, and the desirability for legal practitioners, state representatives and international lawyers to have access to the growing amount of available data, in the form of articles, notes etc. 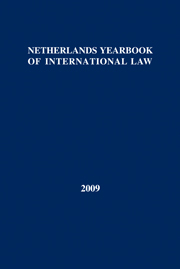 The Documentation section of the NYIL contains an extensive review of Dutch state practice from the parliamentary year prior to publication, an account of developments relating to treaties and other international agreements to which the Netherlands is a party, summaries of Netherlands judicial decisions involving questions of public international law (many of which are not published elsewhere), lists of Dutch publications in the field and extracts from relevant municipal legislation. Although the NYIL has a distinctive national character it is published in English, and the editors do not adhere to any geographical limitations when deciding upon the inclusion of articles. Netherlands Yearbook of International Law can be purchased individually or as part of a subscription to Netherlands International Law Review Marketed and distributed for T.M.C Asser Press.